his piece of fine art jewelry, the Golden Honey Bee Necklace is made of Baltic Amber beads and 22 karat gold bees. As you’ll discover, the illustrious bee has long been featured in symbolic Jewelry and artwork. The fine gold work that you see on this garland took a total of 387 hours to handcraft. In the ancient times the Golden Honey Bee Necklace would have been considered sacred jewelry, something worn by the prophetic priestesses of Delphi or in the royal courts of the Egyptian Pharaoh. In Egyptian Hieroglyphics, dating from around 3500 B.C.E, Honey Bees were used to denote the Pharaoh. Long before the religions of the world were born, the Great Goddess of antiquity, ‘the Queen of Heaven’ was called upon as ‘the Queen Bee’. You see, the head priestess of the temple of Delphi was known as the ‘Delphic Bee’ and the the priestesses of Demeter, ‘the pure Mother Bee’, were called, the ‘Melissae’, ‘the Bees’. Honey bees are famous for their sense of community and illustrious golden industry. The Golden Honey Bee Necklace features the perfect subjects, individual citizens wholeheartedly performing their role while ensuring the flowering of nature. A Bee Hive is buzzing with life and activity, is one body united in purpose in harmony with nature. A Bee Hive is a model of a near perfect society, the Honey Bees are to the hive what the cells are to the hunan body. 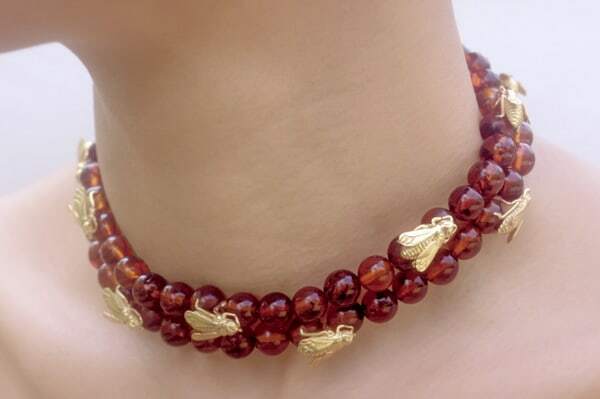 Don’t the amber beads on the Golden Honey Bee Necklace remind you of honey? The treasure of the bees, their golden honey is the ambrosia, the rich nectar of flowers. Few people know but as you might imagine, honey is one of the oldest sacred offerings, a delicious offering to the ancient gods. In addition to the sweetness of its taste, honey has been used since time immemorial to augment the fermentation of alcohol. Honey was also used for healing and the candles made from its wax provided much needed light for our prehistoric ancestors. The Golden Honey Bee Necklace brings to mind the flatteringly play of bees with the young maiden-like flowers. Bees buzz around colorful blossoms in a flirting dance, before finally sampling their nectarous pollen. Honey, being a powerful aphrodisiac has naturally become a word of endearment, as in — ‘I love you Honey’. In fact, the soaring dance of Bees, their ritual of courtship, have made them a symbol of marriage. In ancient legends bees are often portrayed leading a young man to his love and future bride. Like stars in the night sky, bees were carved upon vault of ancient tombs as a symbol of immortality. While Bees represent the active part of aspiration, the joyous work driven by inborn love and ambition, their golden honey is a symbol of reward and accomplishment. Symbolic jewelry like the Golden Honey Bee Necklace are thought to touch the supra-natural dimension. You see, the movement of bees was considered an oman, a voice of nature filled with meaning and portent. They are the winged messengers of the gods, intermediaries between the spiritual and material realm. The activity of bees (where and when they swarm, where and what hive they inhabit) are portents from whence prophetic meaning has long been gleaned. Similar to the “birds of the Muses”, Bees exemplify the attributes of eloquence, poetic expression and wisdom. This is why wearing a piece like the Golden Honey Bee Necklace you may notice that your communications are sweeter and more rewarding.